A Vision of the Future (J.A. Michon). Vehicles, Motion Perception and Judgements of Time-To-Coincidence Collision. (Contributors: R. van der Horst; J.A. Groeger, V. Cavallo; J.A. Groeger, G. Grande, I.D. Brown). Attentional, Cognitive & Perceptual Demands of Driving. (Contributors: F. Luber, P. van Elslande; J. Theeuwes; J.J. de Velde Harnsenhorst, P.F. Lourens; L. Harms; W.W. Wierwille et al. ; H.J. Kayser, M. Hess). Vehicle Glazing: Factors Impairing Visual Perception. (Contributors: K. Dietzel; H. Derkum; D. Southall, M. Burnand). Visual Perception and Vehicle Guidance. (Contributors: C. Berthelon, D. Mestre, P. Peruch; A.H. Reinhardt-Rutland; D. Stewart; A.S. Cohen, R. Hirsig). Attention and Perception in Negotiation of Curves. (Contributors: J.B.J. Riemersma; T. Jurgensohn, M. Neculau, H.P. Willumeit; N. Osaka; K. Landwehr). In-Car Information Displays. (Contributors: R. Haller; W. Walter; G. Bartholomai, O. Becker, W. Schneider, W. Walter; M.M. Popp, B. Farber). Coping with Traffic. (Contributors: A. Katz; J.P. Jouannet, M. Robert, J.J. Davaine; P.C. van Wolffelaar, T. Rothengatter, W. Brouwer). Individual Differences in Drivers Vision. (Contributors: S.P. Taylor; T.H. Williamson et al.). Impairment of Visual Perception. (Contributors: C.J. Baughan; R.G. Mortimer; L.L. Avant et al. ; W.J. Riedel). External Information Displays. (Contributors: M. Colomb, R. Hubert; W. Spijkers; J. Luoma; R.D. Hall, M. McDonald, K.S. Rutley; M. Liger, V. Cavallo, P. Peruch). Visual Perception, Night Driving and Lighting. (Contributors: A. Bartmann, D. Reiffenrath; H.J. Kayser, U. Pasderski). External Environment Determinants of Driving Speed. (Contributors: A. Bartmann, M. Hess, W. Spijkers; E. Tenkink; W.D. Bockelmann; F. Hella, M. Tisserand, J.-F. Schouller; H. Ohta, H. Komatsu). Remote Controls and Simulation. (Contributors: K.F. Holzhausen; A. Christidis, E. Klaerner, O.H. Peters; B. Faerber, J. Ripper). Workshop Reports and Conference Overview. (Contributors: S.P. Taylor; I.D. Brown; A.H. Wertheim; J.S. Kerr; I.D. Brown). Author Index. Subject Index. 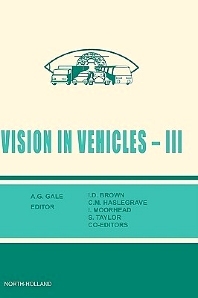 This book is a new interdisciplinary work which presents the proceedings of the third international conference on Vision in Vehicles, the aim of which was to provide an international forum for the exchange of information on current work on all aspects of vision and its relationship to vehicle design. This includes both the internal and external design of the vehicle and its environmental displays, as well as the perceptual and cognitive capabilities of the vehicle controllers.